How often does one get a chance to review YOUR cooking? I thoroughly enjoyed the “fast” version of coq au vin. The wine was superb and the company unbeatable. Thank you for having me over. Stu – you have an open invitation! Happy three years of blogging! Love the dog photograph. Happy 3rdaversary! But for me it’s been a mere 3 minute versary during a cupcake search – go sprinkles :-)) This blog cracks me up and you are now so bookmarked. Thanks for the joy you put into this. It’s informative and entertaining. Just finding it has brought me a smile and will be bringing me to new food adventures. Yay you! (and yours) P.S. 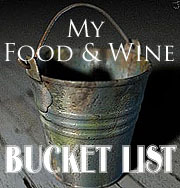 I never thought of myself as having a bucket list, but this makes me re-think the foodie version, Hummm. Wow…that’s the nicest comment I’ve ever received. Thanks for reading sagecoach!